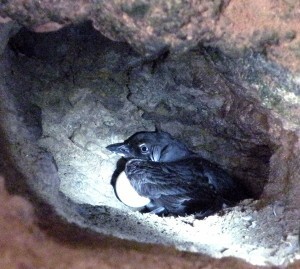 Cassin's Auklet in a burrow nest on Santa Barabara Island incubating eggs. This past spring, MSRP biologists discovered Cassin’s Auklets nesting in an area on Santa Barbara Island that was recently restored. MSRP is restoring seabird habitat on Santa Barbara Island by removing plants that are non-native and replacing them with native plants. Cassin’s Auklets burrow into the ground to make their nests. Most of the island is covered in non-native vegetation that alters the soil and makes it difficult for burrow-nesting seabirds to find suitable habitat. Native plants such as Coreopsis, Silverlace, Boxthorn, California Morning Glory provide more suitable habitat for the seabirds. In 2009, MSRP biologists, staff, and volunteers placed over 1,000 plants in the ground at a site called Landing Cove after ice plant was removed from this area. This site is located right near the island dock. Two years later, the plants were starting to mature making them suitable for seabirds to burrow and build nests. Biologists placed vocalization recordings of Cassin’s Auklets near the restored site and placed artificial burrows throughout the area to help make it an easier transition for these seabirds. At the peak of the 2011 season, there were seven occupied artificial burrows, two occupied natural burrows , and two additional natural burrows that were started. This was a huge success for MSRP biologists. Stay tuned to find out what will happen during the 2012 season!